MÁLAGA, Spain , Sep 24 2012 (IPS) - Over the past year and a half, Spain has been caught up in constant street protests against measures taken to combat the severe economic crisis. But some say the movement has failed to come together around concrete proposals. Public employees, teachers, doctors, students, the “indignados” of the 15M protest movement, and the Social Summit, made up of 150 grassroots organisations and the country’s two biggest trade unions, protest the government’s budget cuts and tax hikes on the streets and social networking sites. Bus sociologist Esther Vivas says people are clearly having a hard time coming together in a coordinated manner. The 15M, a peaceful citizen movement that erupted on May 15, 2011 in protests around Spain against the main political parties and those responsible for the financial system, “managed to unify struggles and protests. But now the scenario is fragmented,” Vivas told IPS. “The resistance movement is weak, right when the policies that triggered it in the first place are getting worse,” said Vivas, of the Centre for Studies on Social Movements at the Universitat Pompeu Fabra, a university in the northeastern city of Barcelona. The most recent austerity measures adopted by the right-wing government of Prime Minister Mariano Rajoy include a rise in the value added tax from 18 to 21 percent, tougher conditions for eligibility for unemployment benefits, and the elimination of the Christmas bonus for public employees. “It’s horrible. After all that training and effort, I’m out of work. My husband is also losing his job at the end of the month,” said Esperanza, a nurse and mother of two who is sending her resumé to Finland and Equatorial Guinea as part of her job search. The unemployment rate in Spain stands at just under 25 percent – the highest in Europe – and at 50 percent among young people. On Sept. 15, tens of thousands of people from all around the country came to Madrid in chartered buses to take part in protests organised by the Comisiones Obreras and Unión General de los Trabajadores, the two main trade unions. The marches were organised by the Social Summit, born in July to channel the popular protests, bringing together groups of immigrants, lawyers, artists, environmentalists, football players and even members of the security forces. One of the movement’s central demands is a non-binding referendum in which people would be able to vote on the austerity measures and on the payment of the country’s foreign debt. But she also said that the protest movements should propose alternative measures, because long-term objectives and proposals are poorly coordinated. Torres said the protesters want the authorities to listen to the people, and are thus demanding electoral reforms that would create proportional representation in Congress, and open lists. Many people are disenchanted with the way democracy has been working in this country. In a survey carried out this month by the Metroscopia polling firm, 73 percent of respondents disapproved of the performance of the right-wing People’s Party (PP) government. Nevertheless, if elections were held today, the PP would once again win, according to the poll, in which 31 percent of respondents said they would vote for it again, compared to 24 percent who would back the socialist party, PSOE. Torres said protesters also want democracy to extend to economic questions, and are calling for social justice. And there is a list of specific demands, such as approval of “dacion en pago” – which allows mortgage-holders to hand back the property to the bank in full settlement of the loan –, the creation of a public bank, and fiscal reforms. César Castañón with the Student Movement of Barcelona said the demonstrations have common causes and demands, although there has been a lack of coordination in the major protests held in recent months. The “outrage” over the budget cuts and other austerity measures “is the link between all of the protest movements,” Castañón told IPS. 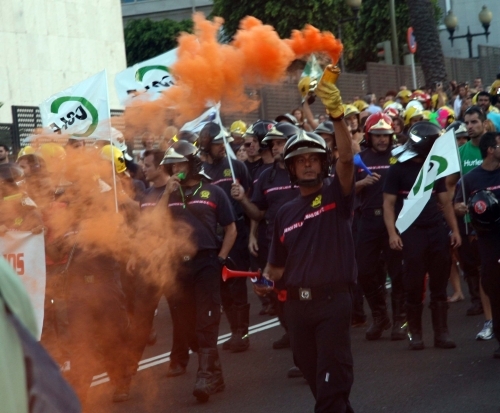 The Andalusian workers union, SAT, reached the city of Sevilla on Sept. 8 after marching through different provinces of that southern region chanting slogans like “fight unemployment” or “we won’t pay the debt with our healthcare and our education”. In August, members of SAT looted two supermarkets, carrying away shopping carts full of basic products, to distribute to the poor. Since March, the former Communist leader of the United Left party, Julio Anguita, has been promoting the Civic Front. In the blog Colectivo Prometeo, he says the front is to become “a representative of citizen power that would increasingly induce the authorities to legislate and govern to the exclusive benefit of the majority” of the population. The Civic Front is active in several cities, and wants its demands to reach the sphere of political decision-making. Its proposals include setting a minimum monthly pension and wage of 1,000 euros; fiscal reforms; and the nationalisation of the banking sector. The common point among the protesters is “the fight for a social solution to the crisis,” Pablo Gallego, with Real Democracy Now (DRY), the platform that gave rise to the 15M movement, told IPS. After the initial protests that led to the emergence of the 15M, it grew in neighbourhood assemblies across the country. But Gallego said the movement is now at a “turning point” and is waning because many people have dropped out. Now, the call for surrounding Congress on Sept. 25 is triggering “a policy of repression,” said Castañón. The courts have summoned several of the organisers, and the authorities plan to deploy 1,300 riot police around parliament on Tuesday. “They are treating the mobilisation as a criminal phenomenon,” Torres said. A repressive response by the state tends to further galvanise opposition. But more than that is needed to catalyse change. These techniques would subject all USA citizens to our “Patriot Act retaliation and NDAA drone strikes. In the USA what do we mean by freedom of speech? “You are free to speak out AND our multinational controlled power elite have ‘legal authority ‘, to make adversaries”dissappear”. OY VEH!